To light a smoker, stuff a handful of fuel loosely in the bottom of the smoker and light it. Puff the bellows to fuel the flames and when it is hot, pack in more fuel, gently puffing all the time. The objective is a cool, thick smoke. Keep the smoker filled with fuel as you work the bees. Low fuel will lead to emission of sparks. 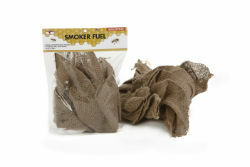 The fuel is easy to light with clean, untreated woven fabric and produces cool, white smoke.